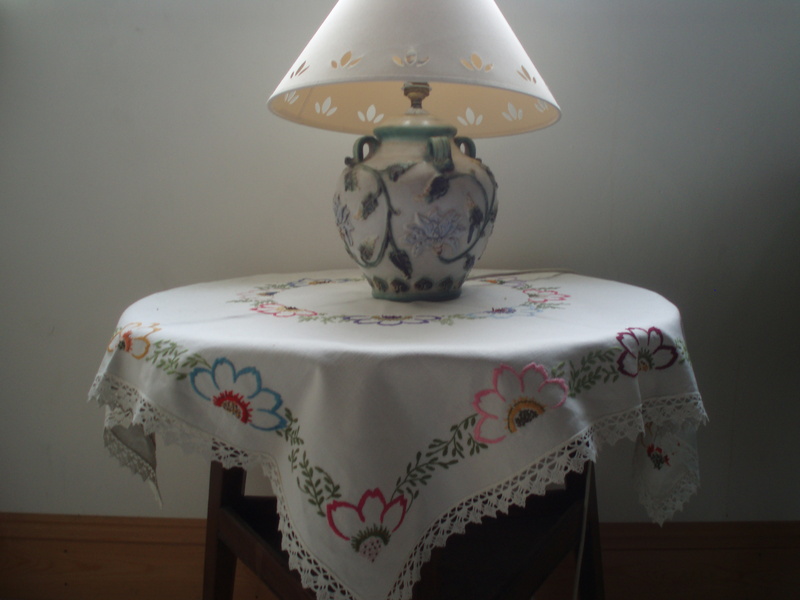 Embroidered Vintage Tablecloths – what’s not to like? 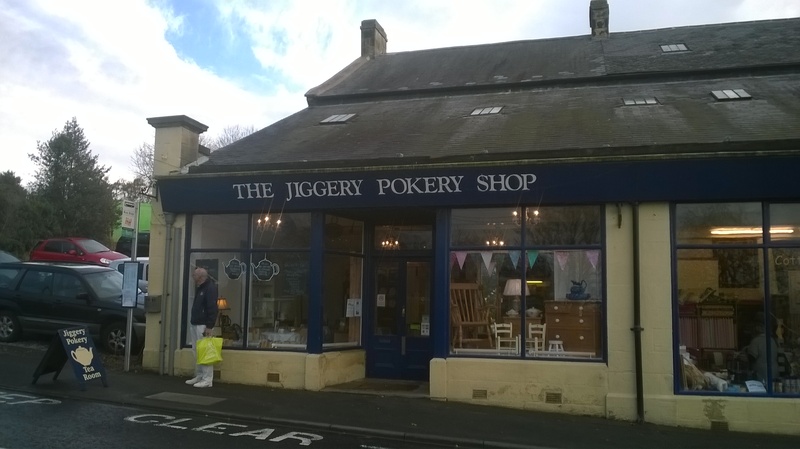 Out and about with friends on Friday last, we repaired to ‘The Jiggery Pokery Shop’ in Mickley, Stocksfield (Northumberland) for lunch. The lunch, by the way, was of the nicest kind for a greyish November day: home-made carrot and lentil soup together with home-made cheese scones accompanied by butter. However, the key reason for including them here is their use of vintage tablecloths. 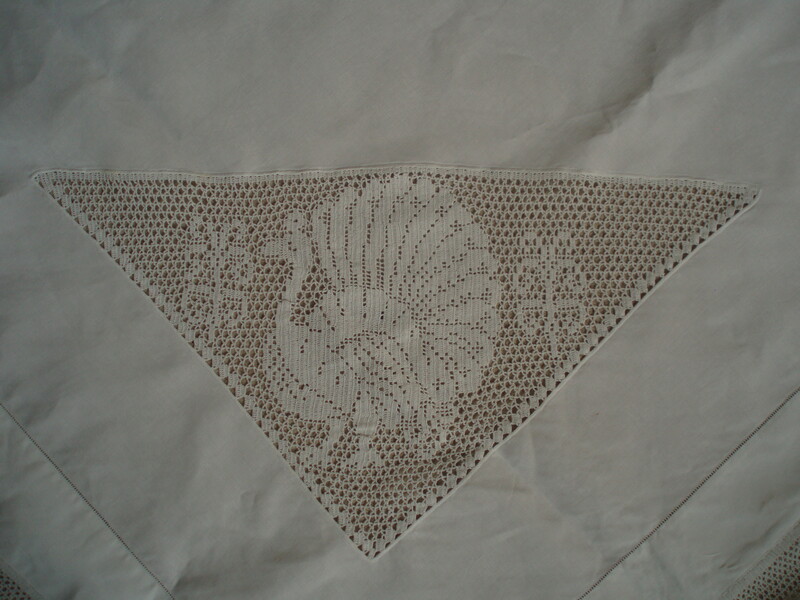 As you can tell from the photographs, vintage embroidered lace-edged tablecloths are used on all of their tables. 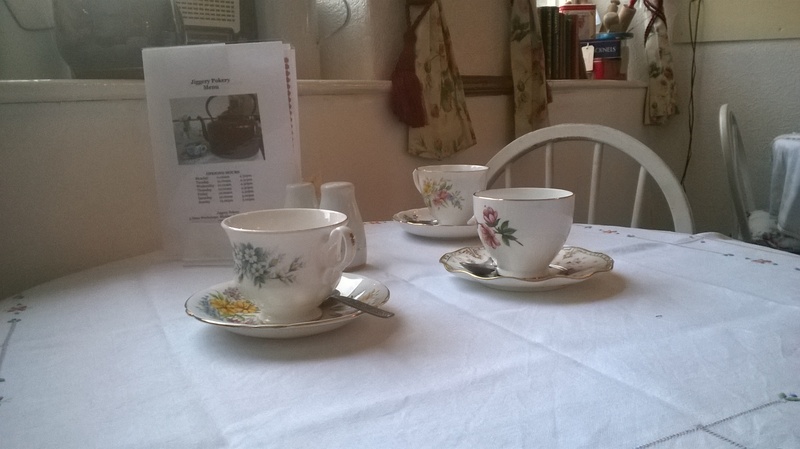 You may also be able to spot the vintage china in use, the flowers on the tables and the home-made cakes at the counter, which all make this a rather special place to go to. 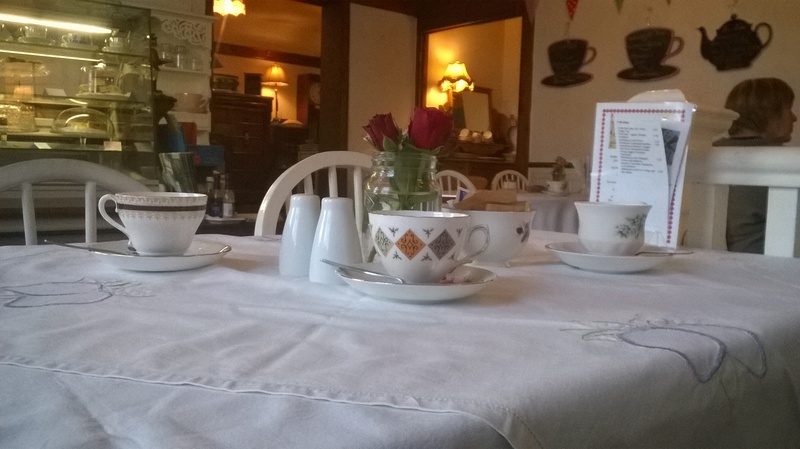 Within and behind the cafe section, are shop areas full of vintage crockery, antique furniture and decorative items. These I will never part with, but I so treasure these lovely items into which such a vast amount of work has been poured that I love looking out for other, similar pieces of table linen. Another aspect of these textiles is the untold story they carry with them. Even with the ones that have come to me, I do not know exactly who made them and the date when each was finished. 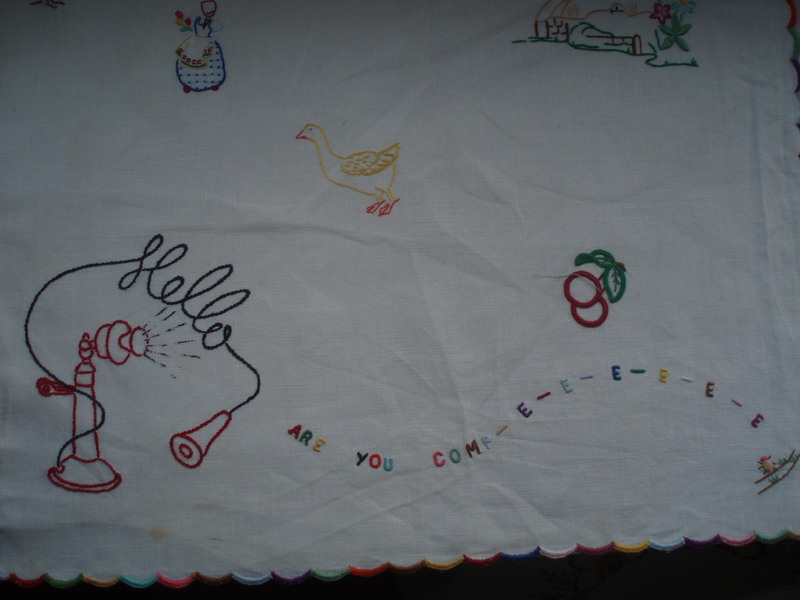 Recently, my friend Ruth brought round two vintage embroidered cloths from her own family to show me and explained that (most wonderfully) she is in possession of a letter which does in fact explain who made them and why they were precious. One was from the 1940s and another from the 1950s. 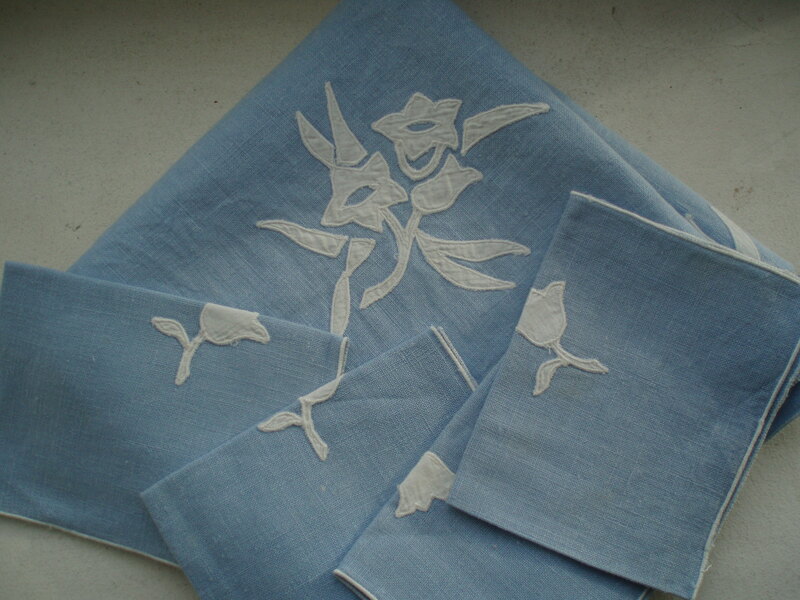 Both were stunning linen cloths covered in hand-embroidered flowers. Such cloths are worth having and worth using, for who do they benefit if they are merely left in a box or drawer? Vintage tablecloths and mats can be used as decorative items in the home as you can see in the photo below of a square cloth embroidered with cheerful multi-coloured flowers. And here, a vintage mat embroidered with initials and key dates for members of my family is used on top of a chest of drawers. For those who worry about vintage textiles getting dirty if they are used in this way, a good solution is to get a piece of glass cut to the size of the top of the table or chest of drawers, so the whole thing can be just wiped over. At the moment vintage textiles like these are still available, but be warned, they will not be around forever. Considering the work that was involved in making them, they are reasonable in price and they are very life-enhancing!